You may remember my pattern review of the Simplicity 2569 Princess Dress, which I made for Melody back in February this year. At the time I figured it would be fairly easy to make this in a 100% machine washable version. Since our summer vacation was planned coincidentally to fall right after Cassidy’s birthday I determined I would make the dress and the girls would wear their matching dresses during vacation. Cassidy’s dress is made from a variety of pink cotton fabrics that Melody picked out, plus a poly lace overskirt and poly trims. It was just as easy as I remembered. The only real challenges were to my math skills. The pattern calls for 60″ wide tulle, but we used 45″ wide lace, so I had to quickly calculate how much lace and then alter the cutting layout accordingly. Instead of 4 wide panels, it had 8 narrower ones. I also didn’t make it a three layer skirt since the cotton & lace were heavier than the tulle. 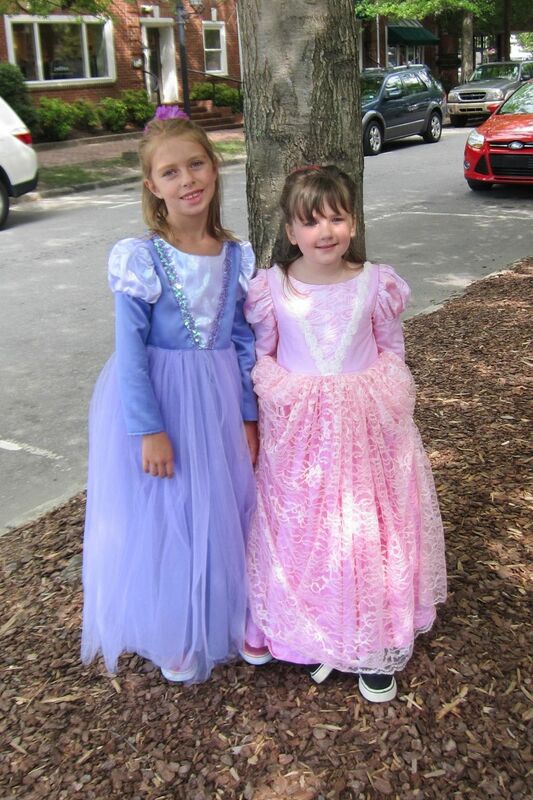 Even though the girls are different heights, they both have on a size 6/7 dress. Cassidy’s turned out to be a bit long once she tried it on, so I used some safety pins to create “panniers” on her hips. As she grows they can be taken out. The photo above was taken in Biltmore Village, NC. It was a humid evening but we walked around the village shopping and having a nice time. The girls got SO many compliments! They were truly the belles of the ball, so to speak. Tara and I were the wicked step mothers, lol. The rest of our vacation was too darn short! Melody loved playing in the backyard with Burke & Cassidy, going to Wonderworks – a kids hands on museum, and just hanging with the kids at home. These are the times the miles feel so great, but the wonderful memories shorten them. Melody has been taking swimming lessons and has gone from not leaving the side of the pool to jumping in, over and over and over, with the water above her head! We are so proud of her accomplishment of overcoming her fears. This is a big step for a child to own their own safety in a pool. Great job Melody! And thank you to Gramma A for taking her every day! Mom has been trained to be a coleader of the Daisy troop this year. I’m excited and we are going to have a great time! I hope to blog more about this as we go along in the year. Some of you understand the concept of an online Mom’s group. We met virtually when we were all pregnant 8 years ago, and we have stayed tight. Lots of us have met in person and we are now just like a great big international mom’s group. I think of these ladies as some of my closest friends. Well, one lady who I dearly love has been diagnosed with cervical cancer. All I can say is that we are praying every day that the treatment beats it into remission and it never ever comes back! When something like this strikes your group of friends, the immediate reaction is “no way, not in our group!” but it’s real and we have to face it. The very hardest, most difficult part of all of this is the inability to pop by and sit with Claire, make dinner for the kids, do the wash, pick up the groceries, whatever. The normal things you do when a friend or family member is in need. This is another time the miles really stretch. 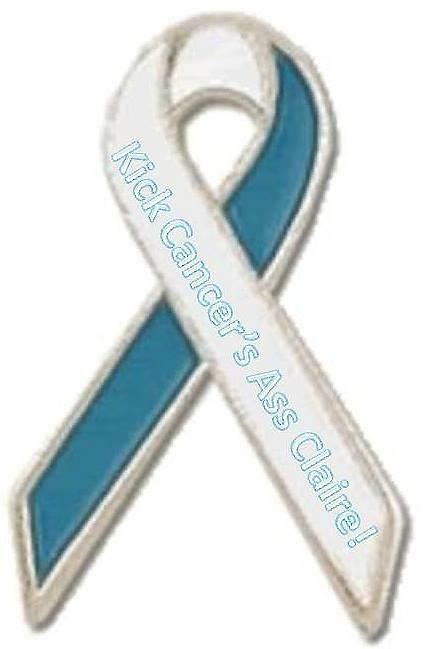 We are with you Claire! That’s about it for now. Melody is back to school next Tuesday and she will be a FIRST GRADER! Yahooo!!!!! Nine years together! We celebrated by going to Las Vegas….by ourselves! Gramma and Papa came over and stayed with Melody and we visited the fabulous shows and sights of Sin City. We finally saw Love, the Beatles tribute show by Cirque du Soliel, which I have been wanting to see since Melody was born. It was truly amazing! The visual and aural spectacle is beyond what I expected and really does celebrate the magic of their music – especially considering they were really only making music for 7 years. That music has endured and finds new fans still today. 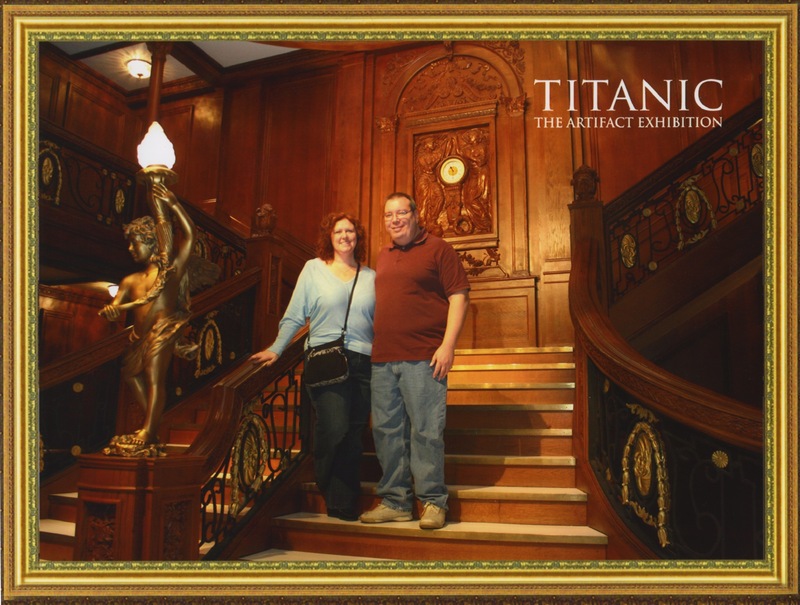 Next we saw the Titanic Artifact Exhibit – a collection of items recovered from the wreck site at the bottom of the Atlantic ocean. The exhibit also includes much historical information and even a corridor built to look and sound like the second class section of the ship. Most impressive is a recreation of the grand staircase, which was made famous in the movie, but which was popular in its own right in 1912. 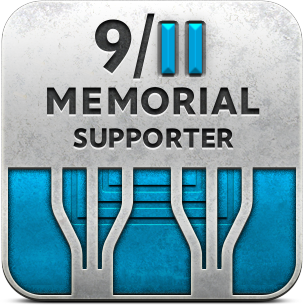 The exhibit is moving, sad, and tastefully presented. Last but not least, we saw Absinthe – a show that we thought was going to be a magic/burlesque type show, but which turned out to be a comedy/acrobatics/burlesque show. Amazing feats of physical strength, arial dancing & acrobatics, and a funny story made for an interesting evening. One thing I remembered about Vegas….everything smells like cigarette smoke and it takes forever to get there and to come home. But otherwise, we had a wonderful trip!